Li Ka-shing may be in for a jolt. 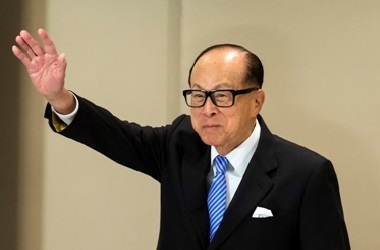 The Hong Kong billionaire’s Cheung Kong Infrastructure unit wants to buy out cash-rich affiliate Power Assets for HK$90 billion ($11.6 billion) in stock. Outside investors have the motive, means and incentive to push for a sweetener. CKI’s pitch is that Power owners can swap stock, at a premium, for stakes in a bigger, higher-performing group with more deal opportunities. This doesn’t really stand up to scrutiny. That’s because Power’s HK$58 billion cash hoard has depressed its returns and inflated valuation ratios. Adjusting for cash, the offer is worth 11.9 times Power’s earnings, while CKI trades on 17.3 times, Churchill Capital notes. And the status quo is fine, if fiddly. Power often teams up with CKI on projects. It could, if needed, broaden its investment mandate. Thus investors have reason to demand more. They also have the power: shareholders with a mere 6.1 percent could veto the deal. The debate then becomes, how badly does the Li family want this, and do the potential rewards of holding out for better terms outweigh the risks for shareholders? On the one hand, the deal is less crucial to Li than the recent reorganization of his flagship holding company. And no-one likes being bullied into paying more. On the other, the transaction is still a key step in overhauling Li’s empire. Failure would be an embarrassing misreading of the market. And because the combination creates less value than the previous revamp, Power shareholders have less to lose by siding with prospective rebels. So hedge funds and others may be tempted to make trouble. If the deal is voted down, Power shares might shed the 9 percent they have risen since it was announced. But they might not give up all those gains: CKI’s long-term interest in a union would presumably remain, and Power could put its cash to better use. Based on regulated asset values the exchange ratio would be 1.15 to 1.2 CKI shares per Power share rather than the current 1.04, Morgan Stanley analysts suggest. So far, investors are attaching little probability to such a bump: Power shares have traded 1 percent or so above the offer. Watch that gap as the shareholder vote draws closer. Cheung Kong Infrastructure shares closed on Sept. 24 at HK$70.2 while shares in takeover target Power Assets Holdings closed at HK$74.2 – a 1.6 percent premium to CKI’s proposed share swap at a ratio of 1.04 to 1. Since CKI announced its bid on Sept. 8, Power shares have on average closed 1.1 percent above the implied offer price, Datastream shows. CKI will send Power shareholders a formal “scheme document” by Oct. 31 and expects the takeover to close by early 2016. The bidder says this is a “win-win” deal that will unite Power’s cash balance will CKI’s “much broader opportunity set” and allow Power shareholders to trade stock valued at 18.4 forward earnings, as of Sept. 8, for less richly valued shares trading at 15.1 times earnings.